If you talk “performance review” with anyone in the corporate world, you might see discouraged and scared faces, because, let’s face it, no one really gets excited about performance reviews. You’ll also, without doubt, end up discussing raises, attribution of variable pay and promotions. And this is indeed part of the topic. However, performance reviews should be primarily seen as a career management tool, which allows a constructive dialogue between an employee and his/her working environment (manager, peers, HR…) and a way to match the needs and capacities between the company and its workforce, while maximizing engagement and productivity. The prerequisite of the performance reviews is formalizing a grid. It will ensure not only fairness but also, and without surprise, the ability for any given employee to know where (s)he is -visibility- and where (s)he can go -projection-. Let’s look at these grids and their components and see how you could adapt them to your company. The first one is the track, which is a job type. At Criteo, the R&D and Product department has four tracks: ENG (engineers), RSC (researchers), EMG (engineering managers) and EDL (lead developers). Each track will have a specific grid. The second component is attributes, which appear on the track’s grid. For engineering, you can have things such as Coding, Quality of code, Product, Leadership & Collaboration, Recruiting (this one only applies to senior engineers). An important side note: These attributes should also be reflected in your hiring process. If you don’t put in the initial work and effort of setting up your expectations and your requirements you cannot review a performance, or even hire the right talent. These attributes are the lines of the grid. Different expectations will be set for the different levels of seniority and for a given seniority each attribute will be scored during the performance review. As you may have guessed, the third and fourth aspects are levels and scores. Levels are linked to seniority (not necessarily correlated with work experience). At Criteo, there are 7 levels. Level 1 is for interns, level 2 is for young graduates, leadership positions start at level 5, where the mission of spreading knowledge, public representation and ability to recruit start to matter. Some tracks require a minimum level. For instance, EMGs need to be a level 5 or above and EDLs a level 4 or above. Promotion is going from one level to another. It’s important to notice that going from one track to another is not a promotion but a mobility. In engineering, as people get seniority they often get stuck under a glass ceiling if they wish not to become managers. Having separate tracks allow people to really choose their path and get recognition. Once you have built your grid for each track, mentioning the different expectations for the different levels, you can build the grid that will be used for performance reviews (now that you know in which track and which level the employee is). Next, you’ll need to determine the right level of granularity for scores. Romain Niccoli, co-founder of Criteo and now CTO and co-founder of Less, warned me: “If you just have 3 scores (Below Expectations, Meet Expectations, Above Expectations) it will be very disappointing. 80–85% of the workforce will be in the meet expectations bracket, 10–20% in above and 0–5% in below. You need to be more granular. Many companies choose to go with decimal values, from 0.0 to 5.0. But on the contrary, it’s hard to make the distinction between 3.2 and 3.3 and it can lead to frustration. You need to find the right balance. A 5 or 6 scale is quite good if you look for simplicity.” A 5-level scale could be: Unsatisfactory — Improvement Needed — Meets Expectations — Exceeds Expectations — Exceptional. A 6-level (which they use at Criteo): Below expectation, Partially Meet Expectations, Meet Expectations, Above Expectations, Strongly Exceed Expectations, Outstanding. Your grids will be key for all HR aspects: hiring, performance, mobility. First, the employee makes a self-evaluation, in which (s)he will be asked about deliveries/achievements, areas of improvement and then they fill in the “Grid” that we talked about. The employee can also ask for a promotion in the self-evaluation. (S)he also elects 4 to 8 peer reviewers, which will be validated or modified by the managers, knowing that any nominated peer can refuse. Second, the peers receive the “Achievements” from the employee and they also fill out the grid, identifying the employee’s achievements, improvements and say if they are supportive of the promotion if it has been asked (of course including the reasons for their decision). All of this will be shared with the employee in a final report. The peer review also includes a blank field that can only be seen by the manager and HR Business Partner so they can share sensitive issues — HR is divided between Talent acquisition (those who manage recruitment) and Business Partners (who focus on the performance, mobility and training), they are nicknamed “HR BP”. Jean-Charles Samuelian, co-founder of Alan, chose not to send the self-evaluation to the peers to restrict potential confirmation bias or anchoring effects at their level. 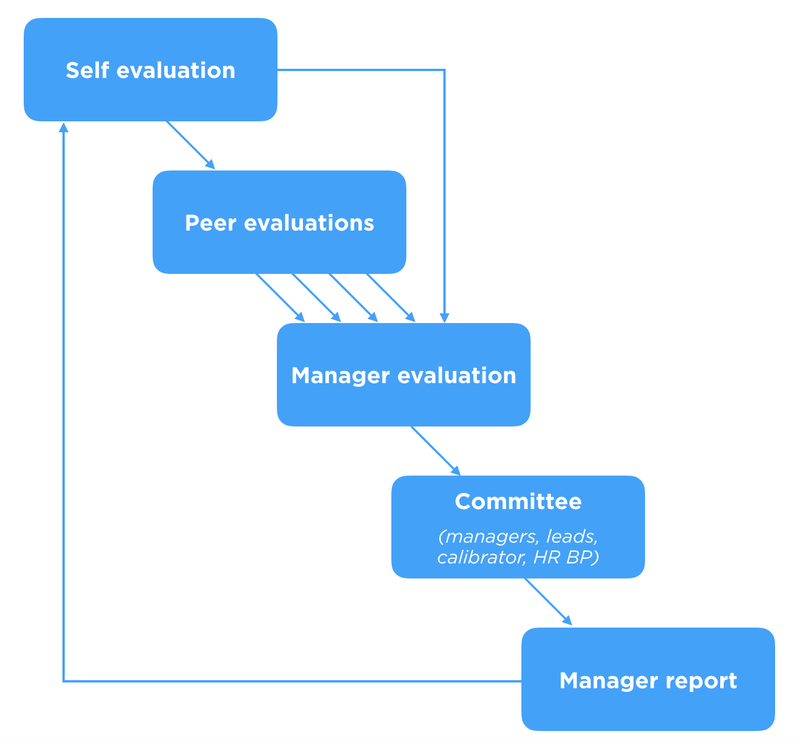 Self-evaluation and peer reviews are directly sent to the referral, whose conclusion will be reviewed by the other peers before being validated and sent. They keep the number of peers between 4 and 5. Third, the manager receives all the reports (employee + peers). (S)he too will make a rating using the same grid, a justification of the rating and a decision about a promotion. This will be sent to the HR BP to be brought before the committee for constructive discussion. Fourth, there will be the committee, composed for Criteo of between 7 to 20 people. “It’s good to be between 6 and 10. When you start to be above 12 people in the group you can start wondering if you should split into two committees”. This committee is composed of three types of people: the managers and leads, calibrators (senior manager outside the hierarchical chain, who has the final word on the chosen score), the HR BP, whose role is primarily to make sure that the discussion is smooth and efficient. Albane told me: “At Criteo, same-level employees can be nominated as peer reviewers but not as a member of the committee. As an additional piece of information for the calibrator, OKRs could be introduced to the committee as well. Albane adds: “OKR (Objective Key Result, a framework often use in tech companies to communicate the objectives and monitor achievements) are not directly expressed in the grid since we only use corporate & business units OKRs. It could be nonetheless interesting to provide OKR to the calibrator so (s)he can have a better, more documented perspective”. Lastly, the manager sends the final decision and reports to the employee, who has access to feedback from his/her peers, their grids, the final decision and feedback from the manager and the committee. “Making the peer review reports transparent to the employee didn’t change the nature and content of reports at Criteo” told me Albane. “We thought people might filter themselves to avoid vexing their peers, but we kept having the same authenticity and constructiveness”. Romain reminded that it was essential not only to give a decision but also to provide the employee with very clear feedback and recommendations for a better self-assessment and paths of improvement. It [is] essential not only to give a decision but also to provide the employee with very clear feedback and recommendations for a better self assessment and paths of improvement. He also told me that it made sense to put in place continuous feedback to make sure to have comments and insights for each project. “If you do the annual review or if you just document once a year, you risk falling into the trap of focusing only on the past couple of weeks or months.” told me Romain. “It is also a good way to make performance reviews much more meaningful and providing guidance and feedback continuously”. 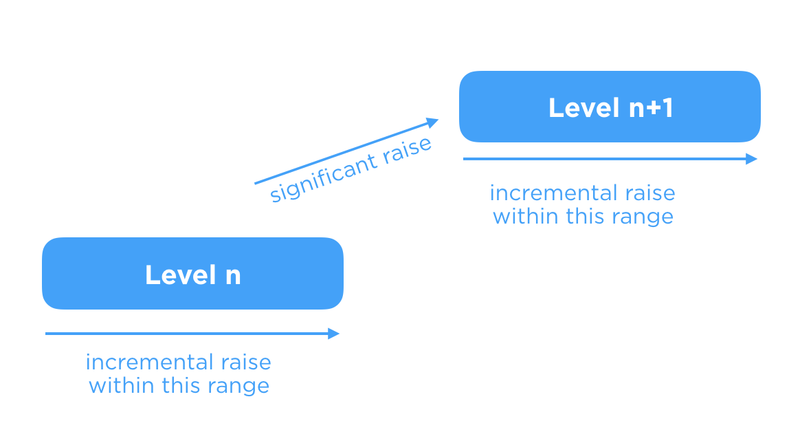 For each level, you have a range of remuneration. You start from any point in a range (you can be directly midpoint when you are hired) but with time you go to the right side of the range, even before being promoted to the next level. For most tech companies, there is a total pocket of salary increase that will be split between the teams and the individuals. Three factors impact the increase: the performance, the compensation ratio (basically where you are within your range of salary for a given level, the closer to the maximum the smaller the annual increase) and exceptional results (initiatives, being part of a very strategic project, etc.). It’s good to have some latitude in the split but most of it should be done arithmetically to ensure fairness and explainability. Regarding equity, they tended to give the new shares to the entire workforce. Yet, they realized it is much more important to focus more on some employees to make a greater impact, which doesn’t mean it is only for the top of the pyramid. To be significant enough, they chose which 30% of the employees will have new equity. The goal is also to prevent churn for those who are at the end of their vesting period (4 years). Albane shared with me the percentage of acceptance of self-nomination for promotion between the levels. From level 2 to 3 -> around 100%. From level 3 to 4 -> around 80%. From level 4 to 5 -> around 60%. Bottom line: The higher the level, the harder the promotion. She insisted on the importance of keeping discussions around rating and promotion separated. “The bigger a company, the bigger the tendency to become mechanistic. Once your rules become absolute, you start losing your ability to innovate, because you value uniformity. Founders need to make sure unusualness is still valued as the company grows and that both HR and members of committees understand the importance of flexibility toward process”, told me Romain. Romain adds: “Well executed performance reviews implies heavy processes. It takes resources away from their work so it’s important to not do them for nothing -when the company is young favouring a lighter and quicker process seems preferable, or take them lightly (worst thing would be deceiving results -such as results that feel unfair- after so much effort)”. For Albane, “it is important to co-design HR processes with managers. It leads to a total buy-in from the teams and you tackle the true problem on the ground. No HR process can work without the implication of the managers, initially and continuously.” When they revamped their policies, the HR at Criteo created a guild called “perf & promo”, whose goal was to co-design the performance review process with HR Business Partners. “It has been a game changer to benefit from their insights and have them fully understand why the processes were in place”. If performance reviews fail to reach unanimity, everyone agrees on something: it takes A LOT of time, while never fully reaching its promise. Research done by CEB shows two very insightful metrics: (1) 9 in 10 managers are dissatisfied with how their companies conduct annual performance reviews, and almost 9 in 10 HR leaders say the process doesn’t yield accurate information; while (2) the average manager reported spending about 210 hours (almost 5 weeks every year!) on performance review related activities. Also, since Herzberg’s (1966) motivator-hygiene theory, most of the research has shown that intrinsic motivations (autonomy, mastery, purpose…) are prime drivers of workers satisfaction and productivity, when extrinsic motivations play a much lesser role, being mostly drivers of dissatisfaction. Thus, organizations relying too much on money as a performance reward run the risk of not really boosting productivity and engagement, and even diminishing the focus, thus the impact of intrinsic motivation. Yet, organizations cannot just rely on the interest and environment of the employee’s mission. Managers still play a large role in employee engagement. A Gallup study estimated that managers account for at least 70% of the variance in employee engagement scores across business units. Unsurprisingly Fortune 500 companies are looking at solving this difficult equation. The unanimous response seems to be shifting from an annually — or semesterly — performance review meeting to holding frequent and informal review points. Deloitte has found that informal and frequent discussions have led to more meaningful exchanges and greater employee satisfaction. Adobe has promoted ongoing discussions between managers and employees to give feedback on performance on the go. The results were striking: a 30 percent reduction in employee turnover and 80,000 hours of managers saved. General Electric has shifted their formal and once-a-year review into informal touchpoints where managers are coaching rather than negatively critiquing employees. Employee engagement has dramatically risen with a fivefold increase in productivity. A big takeaway of this revolution in performance management is the decoupling of compensations from evaluation. 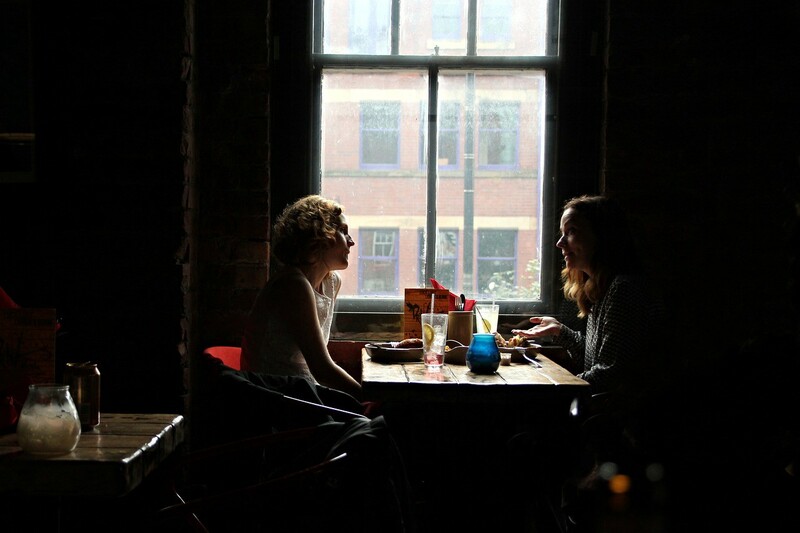 Neuroscience research shows that conversations about compensation provoke a “flight or fight” type of reaction, which obviously inhibits the coaching process. Separating feedback from compensation decisions, through a continuous feedback loop, ensures not only a higher sense of fairness and an avoidance of bias such as the availability heuristic, it also allows a shift from an external motivation based discussion (raise or variable) to a more intrinsic motivation based discussion (mastery, purpose). The beauty of this shift is that you fix the issue while talking about the same issue (performance) and handling the same outputs (employee engagement & money rewards). Research describes this as extrinsic in service of intrinsics, since this reward, recognition and feedbacks process supports one’s sense of competence without undermining one’s sense of self-determination. To do so, the process needs to be “constructive, non-threatening, and work-focused rather than person-focused.” On the contrary, when they are experienced as a form of control, and when they put too many constraints on one’s ability to be creative and perform its mission in the best way, they “undermine one’s sense of self-determination [and thus] have serious detrimental aspects”. By the way, if you are looking for a good tool to ensure continuous feedback loops between employees and managers, check out Butterfly.ai (we are investors in the company). Provide feedback on things the employee can change. Avoid talking about personality traits or characteristics they can’t change. Bottom line: focus on visibility and projection, as Albane told us, by showing people where they are, where we expect them to be and what we can do to help them do so. Maybe the biggest idea to keep in mind is to view performance review session as coaching sessions, while making sure to ensure fairness across the organisation. This article has also been published in my weekly newsletter OneStepFurther. You can subscribe here to receive the next edition.